This engraved slatename plaque is 30cm wide and 15cm high, and is made of natural slate. The slate name plaque is engraved with two lines with up to 12 characters on each line, free of charge to personalise your slate name plaque. A border may be added as an optional extra. If a house number and name is required, the number will be engraved to the left of the name. 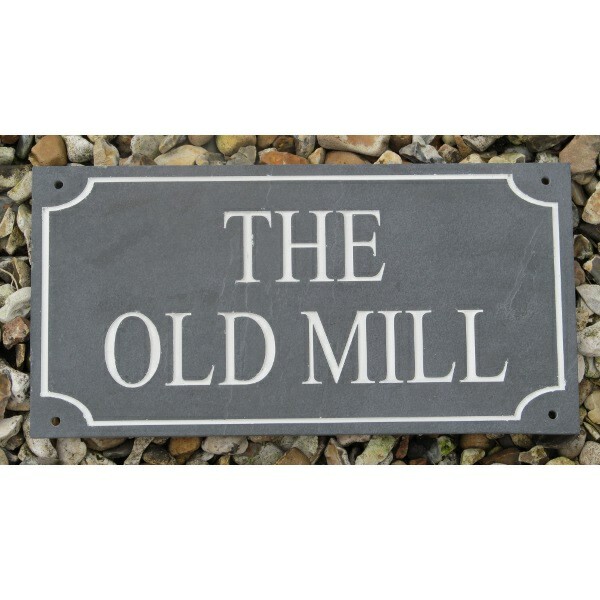 The slate name plaque is supplied with screw holes for fixing, and can have the house name infilled with white or gold, or left as natural slate. The postage rate for the engraved slate name plaque is Band B.